The Sri Lankan Ministry of Foreign Affairs said on Sunday that both Lanka and India are for solving the fishing issue through dialogue. COLOMBO: The Sri Lankan Ministry of Foreign Affairs said on Sunday that both Lanka and India are for solving the fishing issue through dialogue. “There is full appreciation on both sides of the livelihood and humanitarian dimensions of the issue, and the two Governments will, in the spirit of goodwill and understanding that exists, continue to engage in dialogue on this issue, to seek satisfactory short-term and long-term solutions,” the ministry said in a statement. It was commenting on Lankan Fisheries Minister Mahinda Amaraweera’s saying on May 26, that Lanka will not allow Indian fishermen to fish in Lankan waters. “Sri Lanka recognises that the issue of Indian fishermen fishing in Sri Lankan waters is one that requires the careful attention of the authorities on both sides, especially in view of the impact on livelihoods of both Sri Lankan fishermen in the North of the country as well as Indian fishermen,” the statement said. 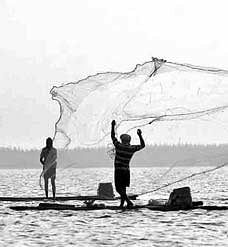 Referring to the request made by Indian fishermen at the Chennai meeting on April 24 to allow fishing in Lankan waters for 83 days per year for three years, the ministry pointed out that the request had been considered, but rejected by Lankan fishermen. “Lanka is approaching the matter of Indian fishermen apprehended in Lankan waters from a humanitarian perspective in view of the livelihood dimension involved and all efforts are therefore taken to ensure their expeditious release,” the ministry said.